TVPaint Developpement today's structure exists since 1997. Its objective is to provide CG artists with original tools. Since this date Hervé Adam reunited a pluridisciplinary staff in order to get the means to enhance the development of his innovating solutions and to guarantee their distribution. Our team has been enriched with an active community of professional users, symbiosis that allows the realization of a workspace dedicated to creation and always carrying innovations. Thanks to this action, the first unified paperless 2D animation production system was born and allows studios to make projects from scratch, from sketches to post-production. Several projects are actually under development to provide the market with solutions for tomorrow's needs. On February 2010, the "Chambre du Commerce et de l'Industrie" of the Lorraine Region rewarded TVPaint Développement for its dynamism and its technological invention, with the "Coup de Coeur" price of the "Trophées Lorraine Export" contest. 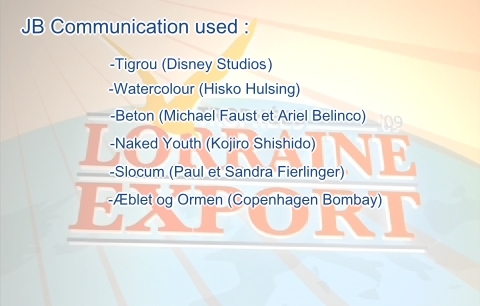 For this occasion, a little documentary about the company was made by JB Communication (click on the image below). The Logo RIP helps and guides teachers in educational multimedia. After evaluating by specialists and multimedia commission's decision, this logo allows to identify which software and multimedia creations answer the best to educational system needs. If you want more informations, contact us. The TVPaint Technology 7.5 sold as Mirage receives a 4 out 5 point product rating from Digit. The TVPaint Technology 7.5 sold as Mirage receives a GREAT rating from MacAddict. The TVPaint Technology 7.5 sold as Mirage receives a 4 ½ Star Product rating from Mac World. Editor's Software Pick of the Show for the Advancement in the Art and Science of Television Broadcast. NAB '98 Editor's Choice Award. Editor's Choice Award for Animation Graphics and Special Effects. NAB '98 Pick Hit of the Show.